About EZ Vet – Paw Watchers Kiosk: EZ Vet- Paw Watchers kiosk would offer your customers a great reason to bring their pet(s) into the store with them. Statistically speaking, when customers bring their pets with them to the pet store they spend more money. When I worked inside a big pet retail chain they stated that pet owners spent 25% more when their pets where with them shopping. EZ Vet- Paw Watchers kiosk would offer your customers a great wellness and preventative care tool to monitor their pets weight on a consistent basis. Pets should be weighed once a month. A fluctuation of over 10% in a month can be a sign of an underlying health condition; and for small pets that can only be 1-2 pounds. 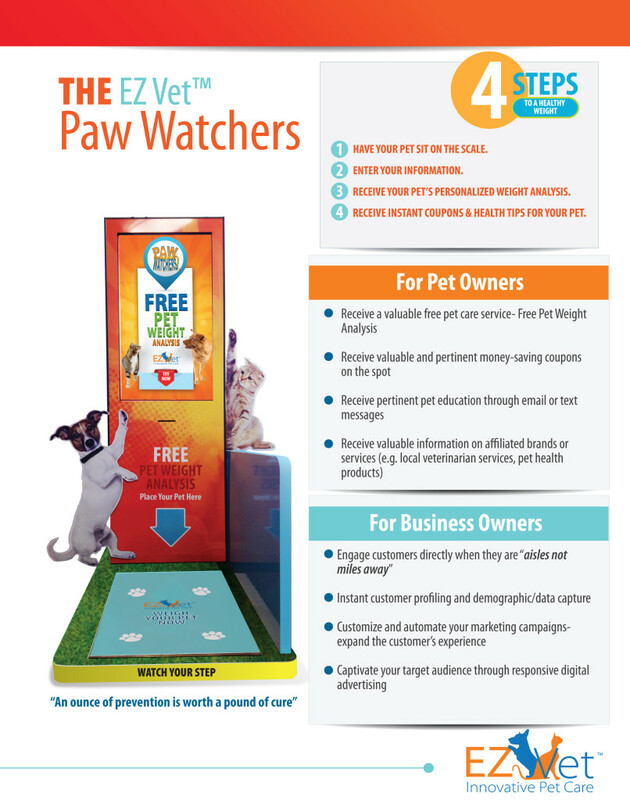 EZ Vet- Paw Watchers kiosk would offer you an automated marketing system as every customer that uses the kiosk automatically receives a text message and an email. These messages can offer coupons to be redeemed instantly, upcoming promotions, pet health education- anything you choose. Also, the data gathered by the kiosk can be exported for outside marketing campaigns, and the reports and analysis received from the kiosk usage offers great insight into the locations demographics. EZ Vet- Paw Watchers kiosk would offer you a new way to drive sales through the captivating digital advertising display and the instant coupon generation each customer receives. Both the digital advertising and the coupons are completely customizable and easily updated or changed as often as you would like. Share the post "EZ Vet- Paw Watchers Kiosk"